Bozhidar Zdravkov was born in 1884 in the Serbian town of Pirot. He was a lawyer and an eminent public figure. He studied Law in Sofia University and graduated in the university of Zagreb, Serbia. In 1914 he moved to Plovdiv to stay here for the rest of his life. He was Deputy District Attorney. After the World war 1 he started his career as a solicitor. In the periods 1932-35 and 1936-39 he had two mandades as a Mayor of Plovdiv, being one of the key figures of the development of the city. 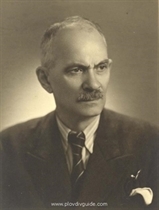 The admittance of the Plovdiv Fair to the Union of International Fairs (UFI) as a full-fledged member is in December 1936 at a UFI-Congress in Paris became a fact only due to the thorough work and the most convincing assertion of Dr. Obreiko Obreikov, the then-President of the Chamber of Commerce and Industry in Plovdiv, and Bozhidar Zdravkov - the then-Mayor of Plovdiv.